Christmas is next month and over at Material World, we are all about making your life easier. This month, we are giving 12 lucky readers a chance to please their closest and dearest. We have up for grabs 12 bottles of the most sensational fragrances. If you win it, you can give a friend this fabulous gift as a Christmas present! A perfume makes a fabulous gift as it is extremely personal, and it shows that you have taken your friend’s personality as well as her preferences into consideration when you selected the scent for her. Up for grabs today is a bottle of Be Delicious Skin from DKNY! It’s a all-over spray that doesn’t just keep you smelling great, but also has skin-loving ingredients to help nourish and soothe dry skin. Your gym bunny friend. She showers up to three times a day because of her active lifestyle, and needs something to keep her skin from drying out. So win this bottle of DKNY Be Delicious Skin EDT for your friend! 1. 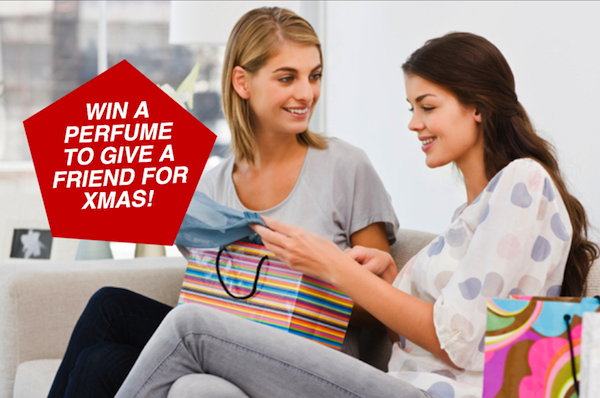 LIKE all Posts about this “Scent Your Love” contest on our Facebook Page between 1 November and 1 December 2013. 2. SHARE these posts with your friends on Facebook. Tag Material World’s Facebook Page and make sure these are on Public so we can verify you have completed this step. 3. PM your details (Name, NRIC, Gender, Email Address) to us with “Scent Your Love: DKNY” in the message. 4. Invite and encourage your friends to follow Material World on Facebook. Once we achieve 8,000 Likes, we will pick the 12 winners of this contest. Help us achieve this by 1 December, 2013 so we can give your friend the prize by Christmas! This contest is open until 1 December 2013. You can take part as many times as you like. Winners will be picked after we achieve 8,000 Likes on our Facebook Page. Only followers of Material World’s Facebook Page are eligible to win. During my uni days, my group friends and I used to make an annual “pilgrimage” to Tioman during the term break. One year, my sister was dating a guy who was – to put it mildy – obsessed with tanning. He had a really golden, healthy tan, and when you are in your 20s, you think, “Yah, I wanna look like I am sporty, I wanna look like a beach goddess. So … TO HELL WITH THE SUNBLOCK!” Following his lead, we skipped the sunblock that year and used suntan oil with the SPF of a staggering total of 4. Yep. SPF 4. Our skin peeled away in palm-sized pieces for a good three weeks after. Now, don’t turn your nose up at this. More than 10 years down the road, I’m paying my skincare debt for this. If you’re sitting less than a feet away from me, you will see my acne scars and the pits left behind by the fiercest of pimples. My skin is easily inflamed. A lot of work is required to keep it “reasonably healthy”. So I was in Bali last week where I spent a day out at the beach. While everyone was taking in the sun, there I was hiding under a huge beach umbrella, frantically coating myself with sunscreen. I did not get burnt – thank god! – but I still got darker. It’s in my genes. I get a mild sunburn driving from my place to Orchard Road. No kidding! On Tuesday this week, Evelyn from Biotherm introduced the newest baby of the brand’s iconic franchise Aquasource to Material World. The serum contains 3 times the concentrations in Life Plankton and Mannose (a naturally-occurring sugar that helps trees store water) compared to Aquasource Gel. Now, first of all, why use a serum? You probably know that serum penetrates the skin better and deeper than moisturizer due in part to the fact that its texture is usually lighter. Serums tend to contain more concentrated levels of active ingredients so they are used to amplify the effects of a skincare range. Once the serum is applied, you put on the moisturizer to lock in the goodness. The same with Aquasource Deep Serum. If you are already a fan of Aquasource moisturizers, you’ll love how the powers of your favourite moisturizer are now more potent and evident with the accompaniment of Aquasource Deep Serum. In fact, in a test of 41 women, 80% of them felt the results of Aquasource were more evident with the use of the serum. If, like me, you are not a regular Aquasource moisturizer user, you can still reap the benefits of Aquasource Deep Serum. How? For this review I tried the Deep Serum for 3 days. I stuck with my normal skincare regime, I did not use any mask or go for any facials, and I continued wearing my usual sunscreen. 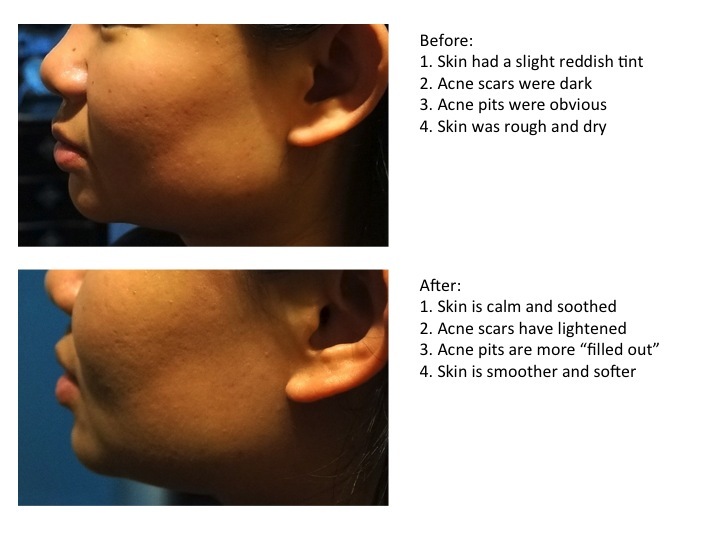 The picture below shows what a difference 3 days on this serum have made to my skin. The ‘Before’ picture shows my skin as inflamed, slightly red from my week in Bali and a bit dull and dehydrated. And, if you look closer, you can see tiny bumps appearing on the skin as if they are about to erupt into a mini-breakout. The ‘After’ picture shows how the redness has gone down, and, most importantly, how my acne pits have appeared shallower and less obvious. The ‘After’ picture was also shot at a closer distance, and cropped much tighter. Yet, you can see the texture of the skin has improved dramatically. It enhances the efficacy of your existing skincare regime. Most skincare regimes would follow these steps: Cleanser, Toner, Essence, Serum, Treatment, and Moisturizer. Since Aquasource Deep Serum is supposed to amplify the effects of the products that come after it, I improvised a bit and applied the serum after Toner. The essence I’m using is affectionately known to its fans as “miracle water” because of its skin-regenerative powers. I’ve been using this essence for 5 years so you need to know that it is already part and parcel of what you see in the ‘Before’ picture. To see if I can give my usual essence a boost, I applied it after the serum for these 3 days, hoping this would help my essence to “penetrate” better and breathe a new lease of life into the way it works for my skin. The experiment (as you can see from above) worked. In my 3 days of trying this serum, I have found that my skin remains matte and soft even after a day out running errands and going for my meetings. I was at a Volkswagen event on Wednesday where I was at a race track (hot and sunny) for a good half of the day. And still, my skin did not get red and stayed comfortably hydrated and soft. Paraben- and mineral-oil free, this serum is great for those who want more intensely hydrated skin but worry if a serum is going to make their skins even oilier and shinier. It is also wonderful for those who want their existing skincare to work harder for them. 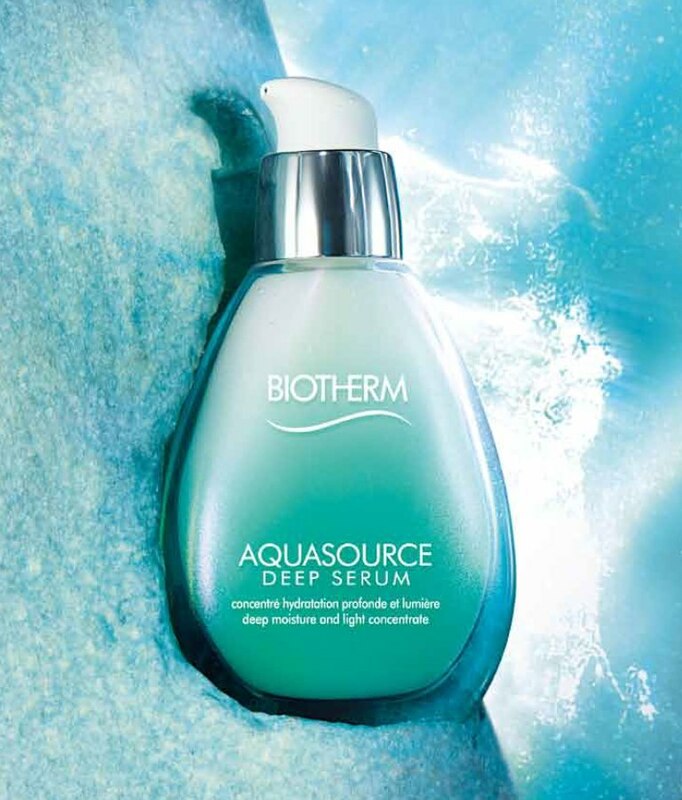 Biotherm Aquasource Deep Serum is now selling at all Biotherm counters at $85. Material World worked with Biotherm to review the Deep Serum. All opinions are the author’s own and were not vetted by the client. You may read our advertising policy here. About The Author: Deborah Tan is a founder of Material World. 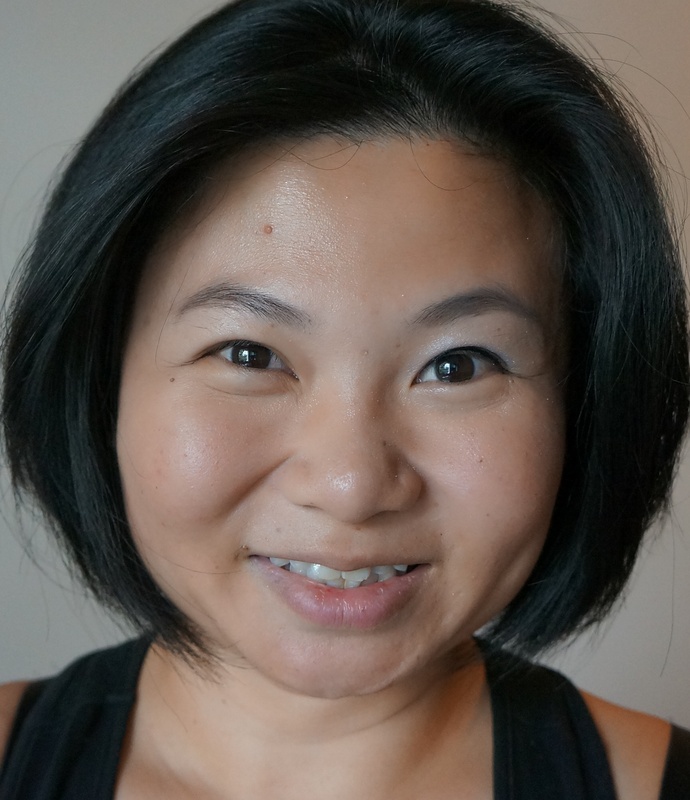 After 10 years of working in magazines Cleo and Cosmopolitan Singapore, she is now a freelance writer/editor who works on this website full-time. She likes liquid eyeliners, bright red lipsticks, tattoos, rock & roll, Mad Men, Suits, and loves it when a new skincare product surprises her … Follow her on Twitter @DebTanTweets. WE HAVE A TOTAL OF 3 FULL-SIZE BIOTHERM AQUASOURCE DEEP SERUM TO GIVE AWAY! 2. Share this review on Facebook with your friends. Remember to tag Material World’s Facebook on your post. Make sure your post is set at Public so we can verify that you have completed this step. 3. Remember to Like our Facebook Page. Only Material World’s followers qualify for this contest. 4. Private message us your details – name, age, gender, NRIC, and email address. Remember to state “Biotherm Deep Serum” in your message so we know which contest you’re entering. Contest ends July 23, Tuesday, 2013. 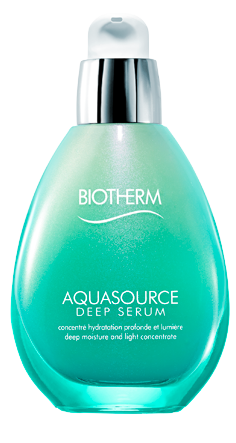 You can also score a 3-day sample of Biotherm Aquasource Deep Serum! 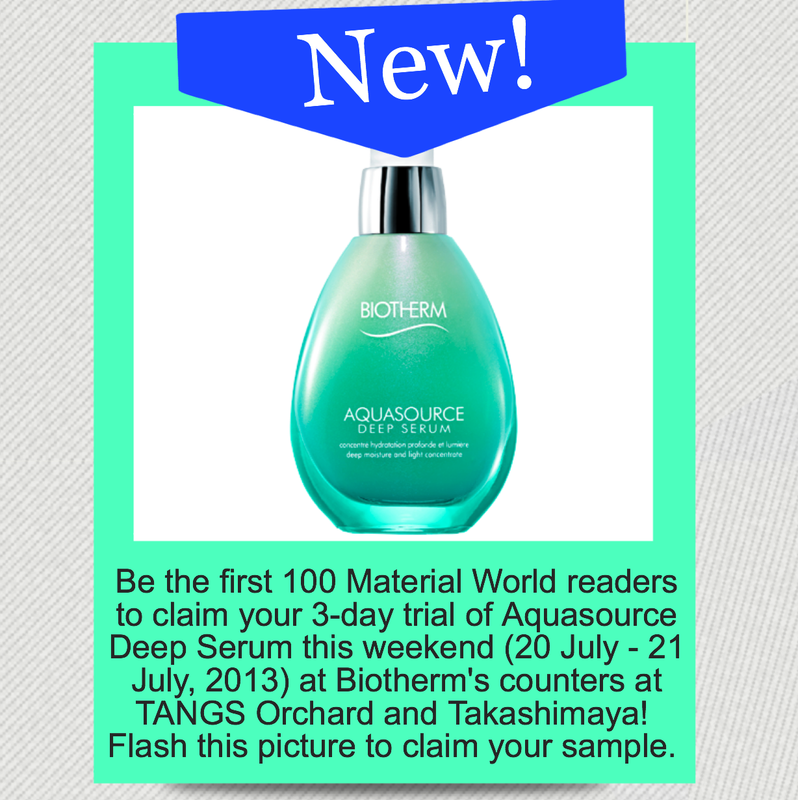 Simply flash this picture at the Biotherm counters at TANGS Orchard and Takashimaya this coming Saturday and Sunday (20 – 21 July, 2013). Flash Giveaway For Material World Readers! Stuck at home this weekend? Or, you’re sitting somewhere waiting for your friends who are – again – running late? Well, here’s something to keep you occupied! Since we receive more beauty products than we four can actually use, we thought, “Hey, why not share the love with our loyal readers – you?” Today, we are giving away 2 jars of Kiehl’s Rare Earth Deep Pore Cleansing Masques ($45 each) designed by actress Michelle Chong (pink) and DJs Jean Danker and Mike Kasem (blue). These limited edition designs are available at all Kiehl’s stores this July and 100% of the proceeds will go towards The Autism Association (Singapore). There are 3 designs in total (George Young designed the third one) so be sure to hop down to Kiehl’s to complete your collection and do your bit for charity! 1. Find the Giveaway Tab on our Facebook Page. It looks something like the picture below. You need to be logged in. 2. As this is a giveaway for the Material World family, you need to Like our Facebook Page first. But … this only gives you THREE chances. To gain 10 additional chances, CLICK this link to learn how to tweet about this giveaway. 3. You can win a further 10 chances by following founder Deborah’s Twitter account too! 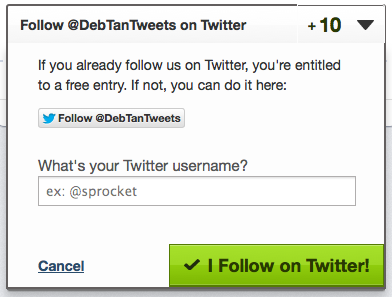 Simply click “Follow @DebTanTweets” and tell us your Twitter handle. 4. Be sure to Private Message us on Facebook your details – name, age, gender, NRIC, email address. State “Kiehl’s Rare Earth Masques Contest” in your message please. This contest ends 14 July 2013, Sunday, 11.59pm, exactly. Hurry! 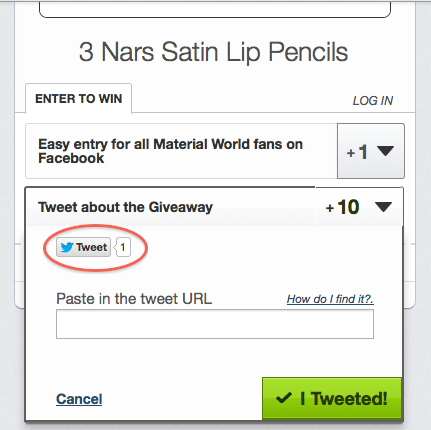 Flash Giveaway For Material World’s Super Tweeter! We’ve only got ONE palette to give away this weekend. 2. There are 10 eyeshadows inside. I mean … can you imagine the number of looks you can create?!?! 3. There is a booklet that teaches you how to work all that makeup magic! 1. Find the Giveaway Tab on our Facebook Page. It looks something like the picture below. You need to be logged in. You can also click here. 2. As this is a giveaway for the Material World family, you need to Like our Facebook Page first. But … this only gives you ONE chance. There are 5 tweets you can tweet out to your followers. Each tweet gives you 10 chances. Tweet all 5 and you get 50 chances! The more you tweet, the better your chances. 3. 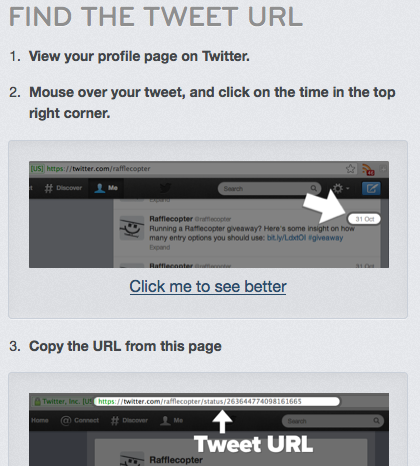 If you need a lil’ reminder … here’s how to QUALIFY for the Tweet function. Click on the “Tweet about the Giveaway”. Once you see this window (shown below), click on the Twitter Bird logo. 4. A secret twitter message will pop up. 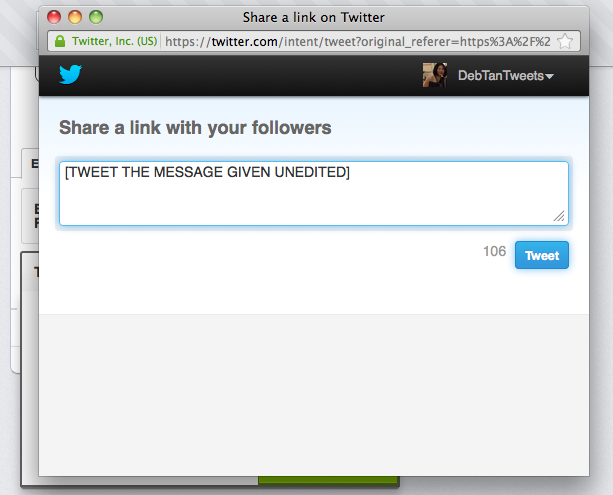 You are supposed to tweet this message UNEDITED to your friends. Also, make sure your Twitter account is not set on Private. If we can’t verify that you have tweeted this message, we can’t let you enter the draw. 5. Once you’ve tweeted, go to your Twitter page where you can see your tweets. Click on the date/time at the top right corner. Copy the URL. See below if you need a visual guide. 6. 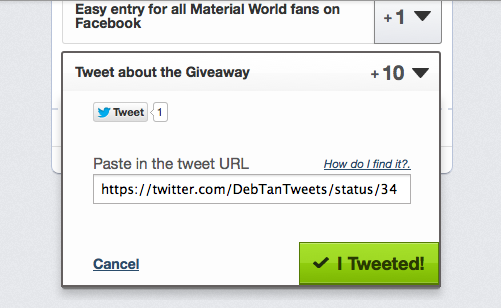 When you’ve copied the tweet’s URL, go back to the contest page and paste the URL in the box below. Then hit the “I Tweeted!” button to complete your submission. 7. Be sure to Private Message us on Facebook your details – name, age, gender, NRIC, email address. 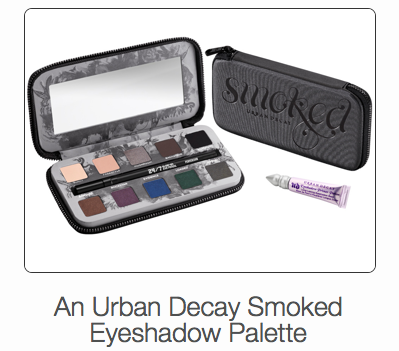 Do not forget to state that you are entering the “Urban Decay Contest”!! This contest ends 30 June 2013, Sunday, 11pm, exactly. I’m known for being a stress-ball – no thanks to my over-achieving personality, I guess. One of my least favourite questions in the world is, “When was the last time you took a holiday?” If you read my post last night, you’d gather that, often, it’s not because I hate going away. Rather, I’d only want to go on a vacation if I am assured I’d be “pampered”. No roughing it out for me! Most of my days are spent “roughing it out” already. I start work at the crack of dawn and often don’t stop until 11 at night. I am – quite literally – addicted to work. If my mind isn’t on work, I feel “lost”. To get me to “relax” would take a lot … a lot. So when Shangri-La emailed us and offered Material World a staycation, Vanessa immediately asked me along. 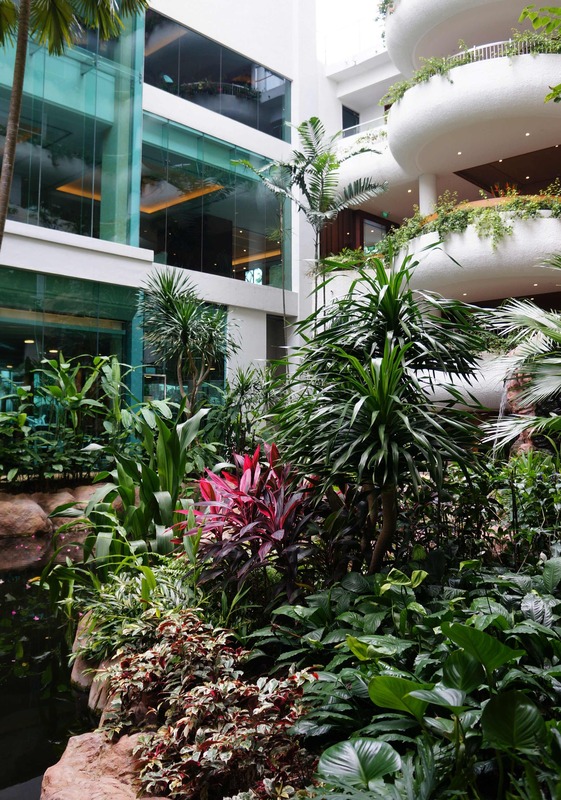 Just one step into Shangri-La’s newly revamped Garden Wing transports you into a world away from the hustle and bustle of Orchard Road, located below the hotel. The first thing that struck me was the seemingly “un-landscaped” look of the lush garden right in the centre of the wing. Huge leaves, colourful flowers, and boulders have been laid out to give the impression of a verdant, undiscovered paradise. The effect was immediately soothing to the mind. I was ready for my staycation. Our room overlooked the swimming pool. With the ample sunlight, fresh air, and sounds of nature surrounding us, it was easy to forget that we were only in a hotel room in Singapore. Shangri-La has lots to offer for the restless. Its gym (HUGE) is opened 24 hours a day. I walked past it at 10pm at night and spotted a couple of hunks working out in there! The hotel has enough F&B choices for the fussiest of palates. The best time to get a good workout at the pool, as we discovered, is in the morning is between 9.30am and 10.30am, before the crowd sets in. If you are looking to work up a sweat, Shangri-La has tennis courts as well. So what do people do at a staycation? I found myself asking this question a couple of weeks before we checked in. Obviously, we weren’t going to “explore” Orchard Road like the tourists. So after the eating and the lounging, what else do people do? Surely time spent lazing about in the room can be put to better use. For Beloved One provided me with a set of products to try for this staycation. Even before we approached For Beloved One to work with, Vanessa has been going on and on about the brand’s popular bio-cellulose mask. “If you stacked up the number of masks For Beloved One has sold, you get a pile of masks as high as Taipei 101!” a fact she likes to remind us. All facials – whether at a salon or DIY – should begin with proper cleansing. Remove all makeup and give your skin a good scrub to slough away all dead skin cells. Exfoliation is necessary to help your skin absorb all these products better. 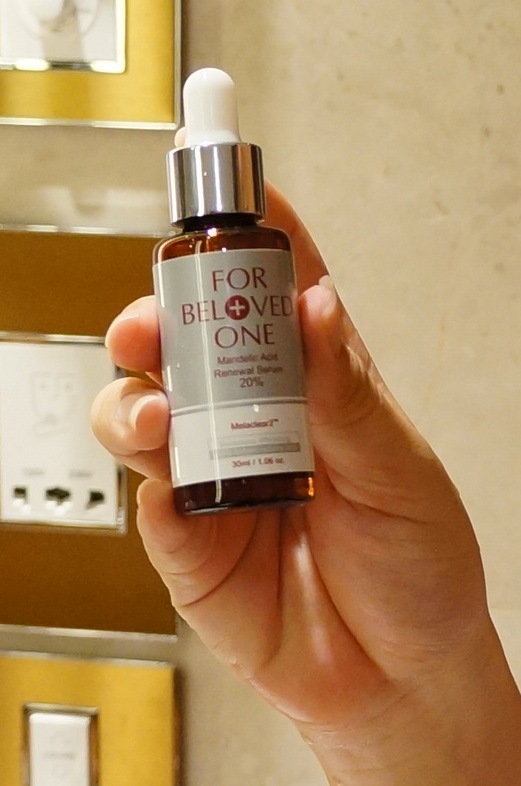 After I’m done with cleansing, I applied a thin layer of For Beloved One 20% Mandelic Acid Renewal Serum. Mandelic acid is an alpha hydroxy acid (AHA), and is derived from an extract of bitter almonds. Touted as a gentle chemical peel treatment you can do at home, this serum apparently penetrates the skin to clear acne and brighten the skin tone. I’m usually a bit sensitive to products containing AHA but this serum did not give my skin any redness and I could not detect any stinging or discomfort. 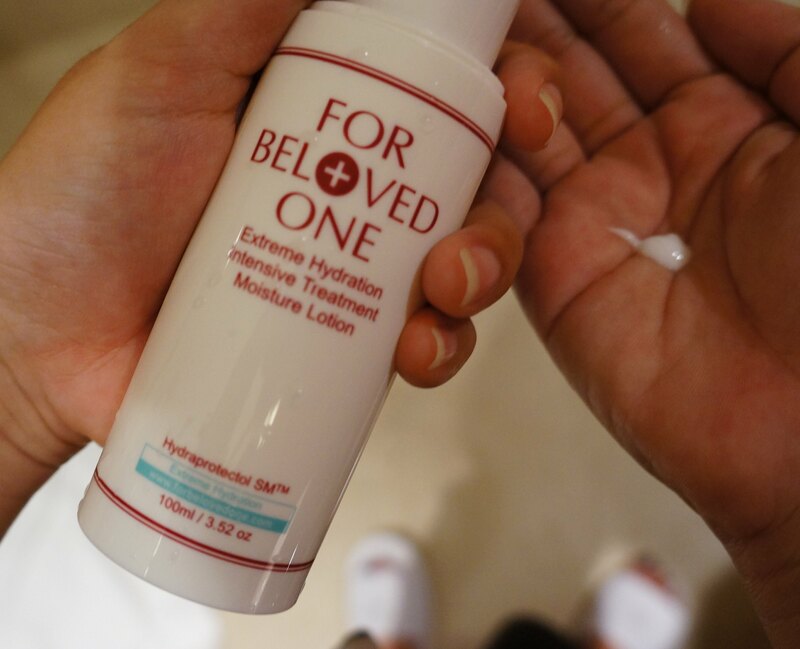 You then follow the serum with For Beloved One Extreme Hydration Intensive Treatment Toner, which contains a host of anti-ageing ingredients to help restore firmness and radiance to the skin. With that, it’s time for another serum – the Hyaluronic Acid Tri-Molecules Moisturising Serum. Watery in texture, it spreads easily on the skin. You can gently pat your skin as you apply this serum to improve the absorption and give your face a massage for blood circulation. My skin felt plumper after this step already. A pearl-size dollop of the Extreme Hydration Intensive Treatment Milk Lotion wraps up the basic regime. The Extreme Hydration series is created to boost the skin’s metabolism, thus enhancing its ability to repair damages that may lead to premature ageing. For ladies in a rush, you’ll be glad to learn that you can also mix the Mandelic Acid Renewal Serum into either the toner or the lotion to save yourself a step. This series also contains Pepha-tight – a film that forms on the stratum corneum to create a “lifting effect” on the skin. Containing a whole host of amino acids, vitamins and anti-oxidants, Pepha-tight has been shown to reveal immediate firming effect that remains visible even after two weeks. 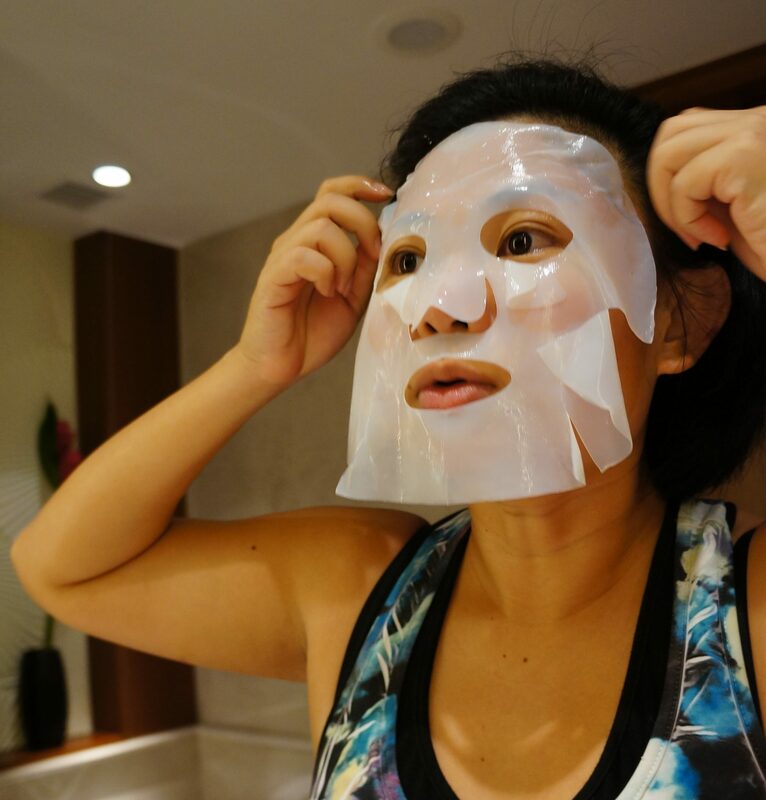 Finally, as a final treat for my skin, I had to use the mask that Vanessa is a fan of. For Beloved One Polypeptide DNA Resilience Lift Bio-Cellulose Mask is a game-changer when it comes to sheet mask. More than 5 millions pieces of it have been sold since its inception eight years ago. The unique texture of the bio-cellulose fibre material gives a mask that is almost “jelly-like”. The mask adheres to the face tightly, ensuring that every pore on your skin is in contact with all that anti-ageing potion on it. I took a nice 15-minute nap on my plush hotel bed, enjoying the cool serenity, trying to keep my mind off work for a while. When I removed the mask, I loved how bright and well-rested my skin looked. There was a youthful plumpness to the skin – like every cell was flushed with moisture. I even allowed Vanessa to take my “After” photo without any makeup. The most noticeable improvement could be seen around the eyes – more lifted, brighter-looking, less tired. This staycation – though just one night – did indeed do me a world of good. My mind, body and skin were refreshed and rejuvenated, and after a fabulous brunch at Waterfall Cafe, I was ready to face another week of work. I continued using the Mandelic Acid Renewal Serum even after this staycation. 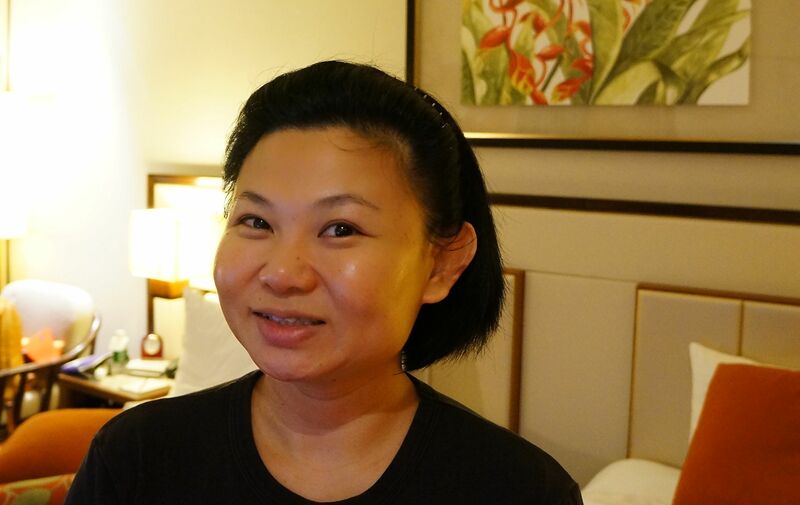 Just last week, when I met Denise for lunch after her 3-week hiatus in Chiang Mai and Luang Prabang, she commented how my skin looked “poreless”. That was when I revealed that I’ve been trying the Mandelic Acid Renewal Serum for a week and a half. Needless to say, she too was suitably impressed. Thanks to Shangri-La for the staycation. 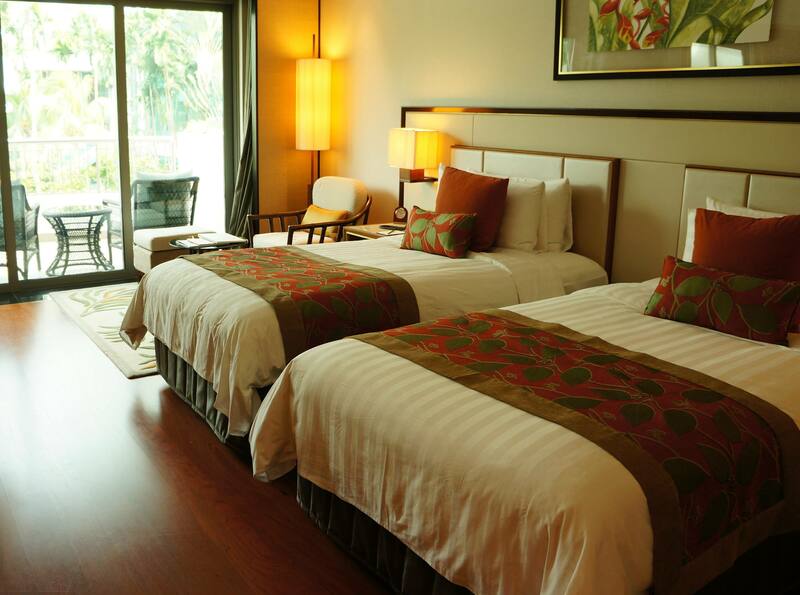 To book yourself a staycation, you may visit its website here. For Beloved One’s products can be found at all Sephora outlets. For more information, check out its Facebook Page here. Material World worked with For Beloved One to review its products. All reviews are the author’s own and were not vetted by the client. You may read our advertising policy here. About The Author: Deborah Tan is a founder of Material World. After 10 years of working in magazines Cleo and Cosmopolitan Singapore, she is now a freelance writer/editor who works on this website full-time. She likes liquid eyeliners, bright red lipsticks, tattoos, rock & roll, Mad Men, Suits, and wonders if people mean it when they say she doesn’t look her age … Follow her on Twitter @DebTanTweets. 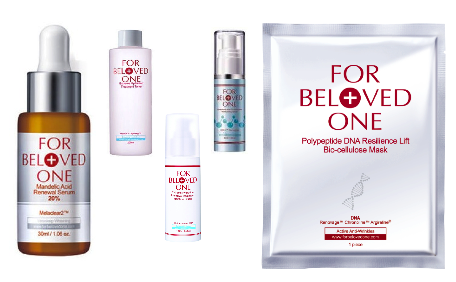 WIN A FOR BELOVED ONE SKINCARE SET! 2. Share this review on Facebook with your friends. Remember to tag Material World’s Facebook on your post. 4. Private message us your details – name, age, gender, NRIC, and email address. Contest ends June 28, Friday, 2013. 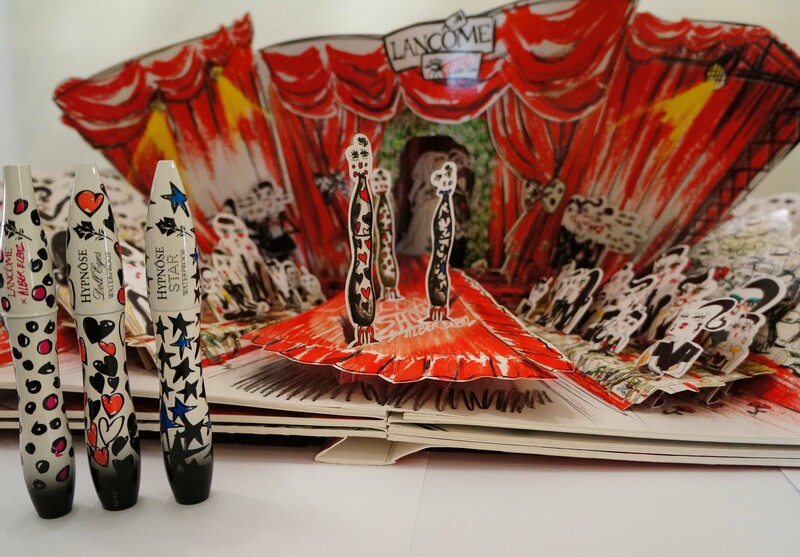 [Contest] Win This Lancome Hypnose Show By Alber Elbaz Set! Dollei Seah with her model. Her look – she said – was inspired by the cute-beyond-words packaging of the mascaras. She hand-painted on the face tattoos one by one. Grego with his model. He was inspired by superheroes because (in his words) he said, “Beauty can save the world!” We are loving the badges he used as hair accessories! Today, we have a special treat just for Material World readers! 2. Three mascaras sporting the limited edition packaging – Hypnose Waterproof, Hypnose Doll Eyes Waterproof, and Hypnose Star Waterproof. These mascaras contain a darker pigment than the usual Hypnose range so you’ll get darker, more glamorous eyelashes! 1. Answer this question: Who is the man in glasses at the end of the video? in the Comment section below. 2. Then click on the link: http://is.gd/5i7V8Z and follow the instructions given on the contest tab. 2. Unlock 10 extra chances by tweeting about this giveaway! Learn how you can complete the “Tweet About This Giveaway” here. Make sure your Twitter account isn’t set on Private. We need to be able to see that you have tweeted about this giveaway in order to give you the 10 extra chances. 3. Don’t forget to Private Message us your details – name, age, NRIC, gender and email address. This contest ends this Friday, 21 June 2013. Eyeshadow palettes are tricky – especially for Asian eyes. Often, the finished result look as if we are wearing only one colour. It is only when you close your eyes that people can see the second, often darker, colour. I used to go crazy over that: “Why bother, right?” But if I tried to make each colour show up on my eyelids, it’d be too much makeup! The point of wearing eye colour is to – hopefully – bring out the shape of your eyes. The brow bone, I feel, is the area that most needs to be brought out because the Asian eye contours aren’t as defined as the Caucasian. I used the eyeshadows on my Left eye (the right side of the picture) so you can see the difference between the made-up eye and the eye that’s makeup-free. Pardon the pimple on my forehead! Great for girls who prefer a subtle wash of colour over their eyes. This said, you will still need to prep the eye area with a base – be it a liquid foundation or an eye makeup primer. I find that eyeshadows tend to adhere better to the eyelids when you apply them straight after the liquid foundation or BB cream or primer, so don’t layer the eye area with a loose powder after you put on your liquid base. The slight shimmer of the eyeshadows makes them perfect as evening makeup colours too. 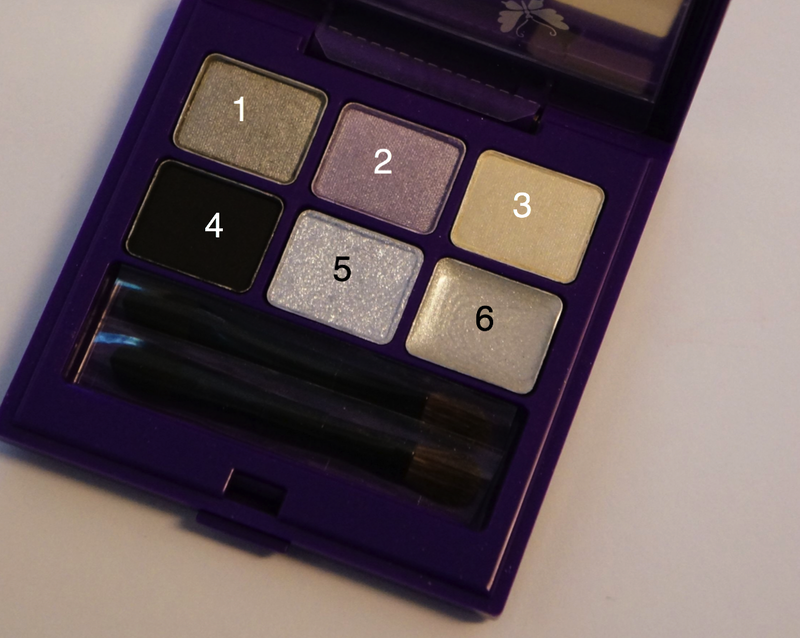 The Anna Sui Limited Eye Shadow Palette 2013 in No. 2 was sent to Material World for review purposes. All opinions are the author’s own. You may read our advertising policy here. We have 3 sets of Anna Sui Limited Eye Shadow 2013 in 02 and Anna Sui Limited Lip Gloss in 02 to give away! 3 sets of these to win! Click to find out more. 2. Answer this question: “Where can you find an Anna Sui counter in Singapore?” in the Comments section below this article. 3. Share this article with your friends on Facebook and tag “Material World” in your post. 4. Finally, PM us your Name, NRIC, Email Address, Age and Gender. The more involved you are in this contest, the higher your chance of winning! Closing date: 9 June, 2013. About The Author: Deborah Tan is a founder of Material World. After 10 years of working in magazines Cleo and Cosmopolitan Singapore, she is now a freelance writer/editor who works on this website full-time. She likes liquid eyeliners, bright red lipsticks, tattoos, rock & roll, Mad Men, Suits, and thinks “less is always more” when it comes to eyeshadows. Follow her on Twitter @DebTanTweets. Last week, Joey – the PR and Marketing Manager of Elizabeth Arden – invited me to Capella at Sentosa for a treat. And it turned to be an extremely enjoyable 90 minutes for me. You see, Elizabeth Arden is launching 2 limited edition sizes of its very popular Ceramide Capsules Daily Youth Restoring Serum. Currently, these capsules are sold in jars of 60. The limited edition sizes will feature a 30-capsule jar and a jumbo 90-capsule jar. The former is targeted at those who have always been tempted to try this acclaimed skincare product but worry if 60 capsules (which retails for $139) were too much. The latter is limited only to Red Door Club members. I’ve never been much of a oil-serum fan. My 90-minute treat turned out to be a facial using these Ceramide capsules. When the therapist started massaging the serum onto my face, I got a bit worried. I had a couple more events to attend after the session and I wondered if I would be walking around town with super oily skin. The skilful massage techniques used by the therapist soon sent me to sleep. When I woke up 15 minutes later, I couldn’t resist touching my face – I really wanted to see how oily or sticky it felt. The serum was nowhere to be found – it was absorbed completely without a trace. Later in the afternoon, Denise mentioned how my skin looked super smooth and radiant. I mentioned to her about the Ceramide capsules treatment earlier and even she was amazed! Before trying the Ceramide capsules, I did a research on what ceramides can actually do for the skin. The top layer of your skin (which is the biggest organ of the human body) is the epidermis. The top layer of the epidermis is the stratum corneum – thin but functions as the main barrier of the skin, and keeps chemicals from being absorbed by the skin into the body. The stratum corneum contains three types of lipids – ceramides, cholesterol, and free fatty acids. There are 9 different types of ceramides, conveniently named Ceramide 1, Ceramide 2 … Ceramide 9. All three lipids have to be maintained at certain ratios for skin to have a healthy barrier function. Scientists have found that sufferers of eczema have significantly fewer ceramides in their stratum corneum. Psoriasis sufferers, however, have the same number of ceramides as non-sufferers BUT they have less of Ceramide 1, 3, 4, and a sub-set of 5 and 6. With age, our ceramide levels also fall – which explains why skin gets drier, takes longer to heal, and isn’t as radiantly healthy as when we were young. First, never dip your dripping wet fingers into your jar of Ceramide Capsules. The capsule shell is made of a vegetal ingredient that will slowly disintegrate when in contact with water. Pick one out, twist the top and push your nail into the neck to break the capsule. Then pour the content out into your palm. As with most skincare products, you should apply it only after you’ve warmed it slightly by rubbing your palms together. Then spread the serum evenly over your cheeks, forehead, chin, and neck. Avoid the eye area. After that, slowly massage the serum into your skin until it mostly absorbed. The serum gets absorbed by the skin really easily. There is no after-shine, no excess oiliness to be seen. In fact, after it sinks in, you’ll need to follow up with a moisturiser. I was sunburnt on the neck area after an afternoon of go-karting on Saturday (I had forgotten to apply sunblock there). After two days of using this serum on my neck, the burn has subsided and I am not seeing any sign of peeling. Obviously, it’s too early for me to report any results regarding improvements to lines and skin texture. But if you’ve been worried whether a serum such as the Ceramide Capsules would cause your skin to become oily, I’d recommend you start by using it every other day, and at night only. That way, as your skin gets blown dry by the air-conditioner, the serum can protect it from becoming too dried out. Then after a week or two, use the capsules every day. Personally, I like how smooth my skin feels whenever I touch my face and this is definitely something my oft-neglected neck needs. 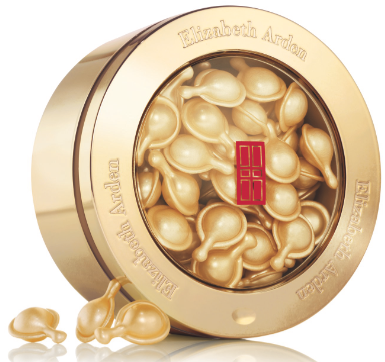 Elizabeth Arden Ceramide Capsules Daily Youth Restoring Serum (60 capsules) retails at $139 at all Elizabeth Arden counters. The limited edition 90-capsule ($165) and 30-capsule ($70) sizes retails exclusively at the Elizabeth Arden counter at Takashimaya in May. You’ll need to be a Red Door Club member to purchase the 90-capsule size. Please check with your favourite Elizabeth Arden counters in Metro, OG and Robinsons when these limited sizes will be available at these counters. The Ceramide Capsules were given to Material World for review purpose. All opinions are the author’s own. Win A 30-Capsule Limited Edition Jar! Click on this picture now! 2. Answer the question to gain 1 chance. 3. 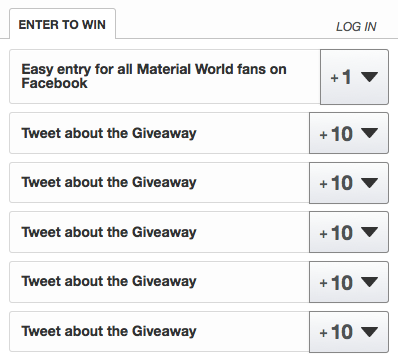 Like Material World’s Facebook Page to gain 3 chances. 4. Then share this article and tag Material World on your Facebook Post to gain 5 chances. 5. Finally, remember to PM Material World your details: Name, Email Address, NRIC, and Age. 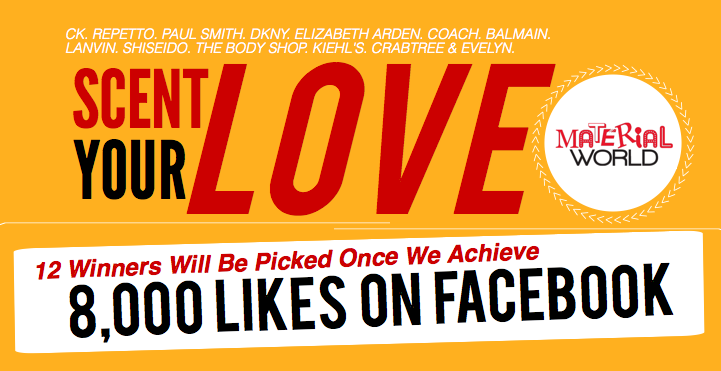 Please state that you are entering the Elizabeth Arden Contest. This contest ends 3 June, 2013, 11am. About The Author: Deborah Tan is a founder of Material World. After 10 years of working in magazines Cleo and Cosmopolitan Singapore, she is now a freelance writer/editor who works on this website full-time. She likes liquid eyeliners, bright red lipsticks, tattoos, rock & roll, Mad Men, Suits, and hopes she’ll look 25 when she turns 45. Follow her on Twitter @DebTanTweets. 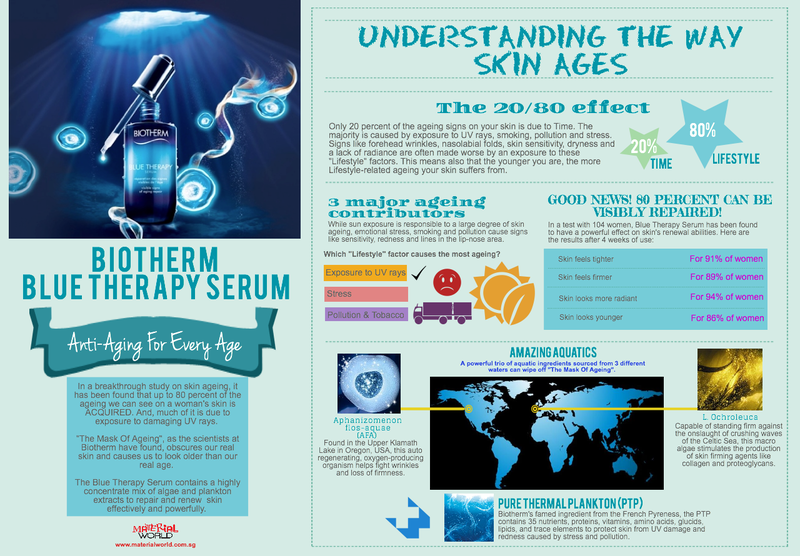 A while ago, we created an infographic about Biotherm’s powerful new anti-ageing serum – Blue Therapy. Click on the image below once and then again to zoom in closer for a better view! Today, we have received 20 1-week trials of this serum for readers of Material World! 1. LIKE the Facebook Pages of Biotherm and Material World. 2. SHARE this blog post with your Facebook Friends. 3. TAG both Biotherm and Material World in your Facebook post. 4. PM Biotherm’s Facebook Page your personal details (Name, NRIC, Age, Occupation, Gender and Email Address) to enter the contest. Closing date for this contest is 21 April, 2013.